Nuke Pro: Why We Should NEVER Trust the Nuclear Industry! At the bottom, drop a comment please. 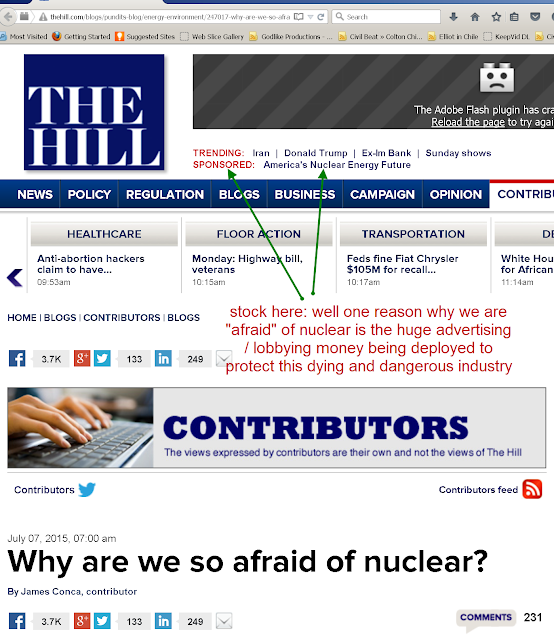 Well there are literally hundreds of reasons not to trust the nuclear industry. But I jotted out a few of the most egrarious real life examples of the last few years. Obama gets on TV and assures the public that no harmful radiation would come to USA, that all we had to do was "keep watching", then he gets on a previously unscheduled plane to go to South America with his family and chosen few. Reactor 3 blows sky high, OBVIOUSLY a Prompt Critical as later verified by EPA test data showing massive amounts of isotopes in the air. Then, "they" decide to censor any more video out of Fukushima, as Reactor 4 sustains damage almost as bad as 3. "Speedi" plume modelling shows obvious hot zones and Japan Government directs "evacuees" to and through the hottest zones, worse even than if they had stayed put. they do not release ANY Speedi results to Japanese local officials, people, or the US Military. In America, all they had to do to reduce the absorbed dose by 50% was to say "stay out of the rain" for a month or two. They failed even this most basic precaution. In Hawaii, all the flies disappear just like TMI, and the sky is angry, charged. Almost daily lightning storms when Hawaii normally gets one or two lightning rounds per year. Strontium is detected in cow milk and becomes big news, then not another peep out of the Department of Health. Now the nukists say "trust us" this next type of reactor will be safe and clean, which has never has a proven working model, as they coerce and lobby legislators to force people to pay more for nuclear energy than for solar. Even Einstein know it was a disgrace to hand this power over the atoms to greedy humans. And Oppenheimer went on video saying "we all felt like we have destroyed the Earth"
And the nukists ponder why we fear their dangerous cartel? Ginna busted on 4 violations, but NRC says we won't "cite" 3 of them because Ginna put them on a corrective action plan. On the fourth violation that were caught with a civil response plan that completely ignored how to evacuate/warn those on the great lake that the plant sits on. This was severe, but after consultation with the NRC Director they decided "exercise discretion" and not impose any fine. stock "sheeshing" here, I guess that means fishermans's lives don't matter. How did a violation like this go on for 40 years?! Or if lake coverage was in a prior plan, how could it have been dropped? It just goes to show how poorly they think about what to do in an emergency. Its criminal really. evacuate Lake Ontario in the vicinity of Ginna during an emergency at an Alert level). deficiency associated with the violation was identified. deficiency is considered an exception to using only the operating reactor assessment program. Section 3.5 of the Enforcement Policy and refrain from issuing enforcement for this violation. The report will be available online generally within 6 days. Stock, I came here from ENE. One thing the ongoing disaster in Fukushima, plus other nuke situations like at the Callaway plant, has proved, once and for all, is that corporate media is nothing but a for-profit propaganda machine. Unfortunately most people just can't believe that 'they' would lie to us citizens, that 'they' are looking our for us. It's truly shocking that more people don't wake up to this. But the NRC controls a lot of media boardrooms and employs an army of trolls online. For those of us awake those things are a given. What I am confounded by is that seeming lack of university students and faculty doing the work and raising the alarm bells. Have they all been told to shut up?? I can't believe the people listed here at the UW, for example, have NOTHING to say... http://depts.washington.edu/marbio/who/people.html. Do you have any theories on the university silence? Those that want to get good grades must play the game with their professors, especially if they want to get "good" recommendations for advanced courses and/or jobs. Those already in the Industry, risk losing their jobs by saying ANYTHING (even safety related) against their Company, and the NRC is "in" on the game despite what they claim. Sorry to be so late to the ☢ Party! Amazing what some well spent money can do and the Nuclear Industry has been spending plenty on PRO-Nuclear "NEWS" stories just like this one, along with inserting Pro-Nuclear advertisements just below the banner, to make it even a better deal for TheHill. On Wednesday, France, host to the major United Nations conference on climate change at the end of the year, passed a law that both re-envisions the country’s energy system and sets an impressive precedent for the leadership potential France could offer come December. The long-anticipated law will halve the country’s energy consumption by 2050, cut nuclear power production by a third by 2025 (from 75 percent of electricity mix to 50 percent), and increase renewable energy to 32 percent of total energy consumption by 2030. It also requires France to reduce carbon emissions by 40 percent by 2030 compared with 1990 levels, in part by reducing fossil fuel consumption by 30 percent in 2030 compared with 2012. The emissions reduction requirement is in line with the E.U.’s 28-country commitment to cut emissions at least 40 percent by 2030. That’s a lot to keep track of. As part of the effort, the French parliament will have to produce “carbon budgets” every five years, which will help set emissions targets for different parts of the economy. Large emitters will face a more stringent carbon tax that could nearly quadruple by 2020 from its current rate of 14.50 euros ($15.93) per metric ton. France introduced its domestic carbon tax in 2014 to cover companies not regulated by the E.U. Emissions Trading Scheme (ETS), including those consuming natural gas, heating oil, and coal. The tax later expanded to fuels including gasoline and diesel. Originally, it started at 7 ($7.69) euros/metric ton. While the fossil fuel, greenhouse gas emissions, and renewable energy targets likely stand out to the international community, the rapid curtailment of nuclear power is probably the most substantial, and controversial, domestic element of the law. France is the second biggest nuclear energy producer in the world, and the country that relies most on it for electricity, with 58 reactors at 19 different power stations. In his 2012 campaign, French President Francois Hollande promised to cut back the country’s reliance on nuclear power. The new law effectively means that some of the older nuclear plants will close in the next couple years to meet the 63.2 gigawatts production limit to be put in place. Ya, France is getting their head screwed on straight. With all their aging reactors this comes a little surprise but every decommissioned reactor is one less Fukushima threaten the rest of the Planet. if people have sense anymore they will not fly so much. My geiger counter, a medtronics radalert w lnd712 small pancake s alpha beta gama. blocked mica window for a while. It went up to 500cpm from 16cpm backgound in portland to chicago. stayed at 500 a good part of trip. must have been mostly beta and gamma. Don't know if you saw my article on geiger at altitude and the patented "Beta Blocker" technique. Cosmic is gamma, so if you block the Beta and the count goes way down, then you know it is not the Cosmic, but in fact, lots of radiation in the upper atmosphere itself. Your measured 30 time ground level, same as my range. The Inspector is quite sensitive so ground level is around 30 CPM, 900 at altitude. Every time "nukular" says "trust me", i keep hearing it translated from "Yiddish". Say, isn't Braamstrahlung phenomenon associated with aluminium aircraft skin & framing during flight? Was taught in school (yup, pretty uptite - lol) that Cosmic Rays were photons with frequencies exceeding that of Gamma. However; that was woefully incorrect it seems. Last i read, Cosmic Rays are actually high-speed relativistic particles, such as protons & electrons (& anti-particles). Of course, was incorrectly taught that "Noble Gasses" were inert. Would a coincidence detector be in any way relevant? Not wanting to sound like a broken record a broken record, but aren't spectra important too, as i let loose my "inner Jacob Two-Two"? More data ... need more data (not less). Of course, bringing a detection lab on as carry-on can't be that easy. Dammit though "Jim", they could build a complex computer calculating trajectories of a metal ball into a set of shoes to beat Roulette. http://physics.ucsc.edu/people/eudaemons/eudaemons.html 6502 CPU, eh? That code could have run on an Apple I or ][ series. There must be a way or three! There is always more than one way to skin a cat, so-to-speak! No matter how you do it though, the SPCA never likes it. d'oh. Quote: "A cosmic ray is a high-speed particle--either an atomic nucleus or an electron--that travels throughout the Milky Way Galaxy, including the solar system. Some of these particles originate from the Sun, but most come from sources outside the solar system and are known as galactic cosmic rays (GCRs). Cosmic-ray particles that arrive at the top of the Earth's atmosphere are termed primaries; their collisions with atmospheric nuclei give rise to secondaries." ... "About 85 percent of the GCRs are protons (nuclei of hydrogen atoms), with approximately 12 percent consisting of alpha particles (helium nuclei). The remainder are electrons and nuclei of heavier atoms. Because most cosmic-ray primaries are strongly influenced by the Earth's magnetic field and the interplanetary magnetic field, most of those detected near the Earth have kinetic energies in excess of about 1 GeV (gigaelectron volts, or one billion electron volts). This energy corresponds to speeds greater than about 87 percent the speed of light." ... "Because of their deflection by magnetic fields, primary GCRs follow convoluted paths and arrive at the top of the Earth's atmosphere nearly uniformly from all directions. Consequently, identification of cosmic-ray sources cannot be based on direction of arrival but rather must be inferred from their abundances (or charge spectrum). This can be done by comparing cosmic-ray abundances with those deduced spectroscopically for stars and interstellar regions. The relative abundances of different elements among cosmic-ray nuclei have been well studied for particles with energies from roughly 100 MeV (megaelectron volts, or one million electron volts) to several tens of GeV. " Huh. Any Cumulonimbus clouds around during measurement? Quote: "As well as producing spectacular lightning shows, thunderclouds can also sometimes emit strange long-lasting bursts of gamma rays." ... "The researchers observed cosmic electrons, which — after arriving at the Earth’s atmosphere — were accelerated to relativistic speeds in a thundercloud’s electric field. Occasionally these electrons collide with air molecules knocking off electrons which are also accelerated in the field. This can lead to a runaway or “avalanche” of electrons that can emit bremsstrahlung gamma rays if they reach relativistic speeds. “We made a simultaneous detection of gamma rays and energetic electrons arriving from thunderclouds” — the first such observation, Tsuchiya told physicsworld.com. " Ah, I see. Since electrons will not travel far, what you measured was emitting electrons or beta radiating from within the compartment. As air is recirculated within the cabin. The air circulates until eventually it is drawn into the lower fuselage, where about half of it is vented overboard—sucked out by the pressurization outflow valve. The remaining portion is remixed with a fresh supply from the engines and run through filters, and the cycle begins again." Try a flight on a 787 on same route for comparison, perhaps. Further Quote: "The Boeing 787 has the healthiest air of any commercial plane, thanks to filters with an efficiency of 99.97 percent." Thid dud thing is bill duff stock. Be careful. So strange to react this way about geiger counters. Nuclear radiation is invisible. Why not geiger counters. The posts are so long and convoluted. They make no arguement against why there could not be beta radiation in the stratosphere. They are simply diversionary. Also argues from the flawed technique of authority like the previous guy did. The bremsstrahlung diversion is laughable. This person implies that all the beta radiation you saw was from cosmic rays interacting with the fuselage of the plane. Why is it when demonstatable evidence like this is presented, it is always met with such a large litany of logical errors and diversionary tactics? No skin off this persons rear if there is lingering fuku radiation affecting flying. Why go after it so aggressively? There are leaks in fuselages and pressurized air constantly leak air where by new air has to come in. Why do the geiegers only go off at certain altitudes. All seems very strange to me, this empty diatribe. By previous guy I mean loose nukes or Bill Duff in that last post. I do not understand this person dud. Maybe not bill duff but very strange nonetheless. The links this person uses are very odd to stock. Wow. So sneaky and subterfuged. They are getting very good. Wolves in sheeps clothing. There are all those high radiation readings nichols posts for major cities in the us. That radiation is coming from somewhere up there. This person protestith too much to not be trying to obfuscate what was seen. Too many people getting sick on airplane flights like radchic. The cases of the Alaska airline attendants developing radiation sickness in 2011,2012. Not likely that thunderheads are generating that kind of beta radiation. Two points . One, denying that geiger counters can validly record increased manmade radiation. Two denying that their is ongoing and residual radiation in the atmosphere and jet streams from fukushima. Ya, the upper air detections are sometimes scary freakin high. could be Fuku or could also be weakening magnetic field/shield. well sorry to dud if hes a good guy. no one i know says they are using geiger counters to identify radionucleides. probably need a gamma spectrometer and a lot of patients for that. i know that good medronics geigers have alpha beta gamma capabilities and use lnd gmts. also well designed circuitry. you cannot see ionizing radiation. major spike on geiger counters can indicate a radiological event or fallout. nuke pukes hate geiger counters and put out as much disinformation as possible to keep peole from using them. so did you get a photomultiplier tube that you are going to add a scintillator to stock? I like to think am a good guy. Of course many are the hero in their own personal narrative. [sarc] My constant use of ad-homenim and my constant attacks of anne must give it away [/sarc] (i appreciate and respect anne et al, btw). You will know people by the fruit their labors bring forth, am thinking, whither they be sweet or bitter. You have found some of my shortcomings, i see. They are there, warts and all. I appreciate the constructive criticism though. The need for focus is apparent, yet there seems to be "a universe" within every topic. Maybe a return-trip to the basics (the math, #1) would be in order. Glad i kept my notes from school 30 years ago. Some info will be out of date, yet the math should be "timeless". "Compton Scattering" was something i was reaching for, yet could not quite grasp. That is, until i started reading other comments on the thread i should have added to. Not arguing against the usage of Geiger-Mueller counters. The more instrumentation the merrier was what i was hoping to convey. Apologies to you as well for the long convoluted post. Didn't intend to be distractionary. Was hoping i may have stumbled upon something others might not have considered, leading to an "AHA!" moment for somebody else. Radio Astronomy might offer more insight, in addition to other methods of measurement. Ontological could be an excellent resource on relatively inexpensive off-the-shelf components that don't fall afoul of FCC/FAA regulations. There are some interfaces i've seen advertised by Theremino that enable connection of some compatible Geiger Counters to smartphone or laptop/tablet (WhatHaveYou) for some spectrometry.